It’s 2030, and a pack of autonomous vehicles cruising down Interstate 64, bumper-to-bumper and at high speed, overtake a large tractor-trailer. As the cars adjust their paths to go around the lumbering truck, they communicate wirelessly to one another to coordinate their movements. Within minutes, the cars clear the truck and keep going. It all looks fairly easy, but it’s not. If the large, reflective surface of the truck interferes with the wireless signals, well … it might not lead to a great outcome for the passengers. This is just one of the technological hurdles that must be overcomed if the bold new future of autonomous vehicles is to be realized. “There is a good reason we don’t ordinarily put the words ‘safety-critical’ and ‘wireless’ together,” said Cody Fleming, one of three University of Virginia engineers who nonetheless are working together to devise a system that would allow mobile wireless communication for situations in which safety is paramount. Fleming, Kamin Whitehouse and Lu Feng are combining their interlocking expertise in wireless channel and environmental modeling, formal analysis of wireless protocols and physical system control to create a model of how connected autonomous vehicles might communicate. 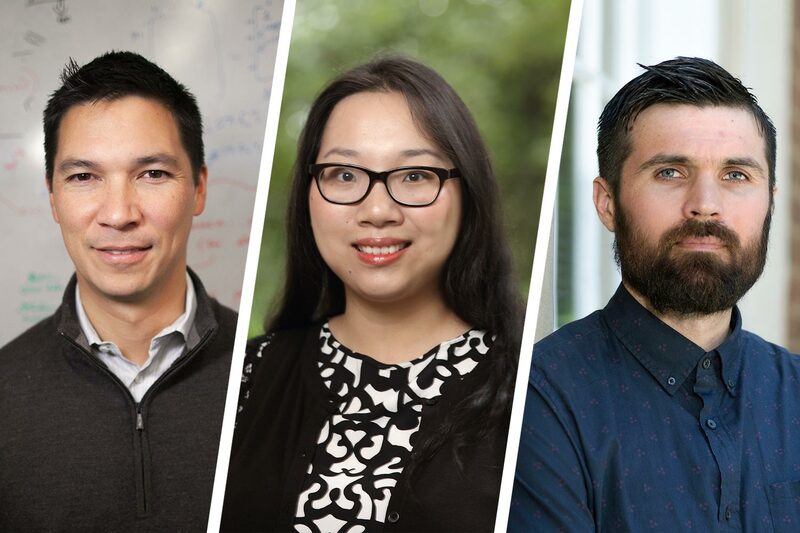 The three researchers are members of UVA Engineering’s Link Lab for cyber-physical systems, which develops systems in which digital tools, sensors and networking capabilities are embedded in physical objects. The National Science Foundation determined the group’s proposal has merit. It provided an $800,000 grant for Whitehouse, Feng and Fleming to develop a prototype system. The key to assessing the challenge they have set for themselves is understanding how connected autonomous vehicles might be deployed. For maximum efficiency, transportation planners envision platoons of autonomous cars moving nearly bumper-to-bumper down highways at high speed. These vehicles would be in constant communication with each other about their activity. If a car perceived an obstacle on the road, it would communicate the evasive action it intends to take to all other vehicles, giving them time to respond appropriately. Even the slightest break in communications could cause disaster. For instance, vehicles passing a tractor-trailer with a large reflective surface can generate multipath interference that can cancel out the communications signal. In circumstances like this, following vehicles have no way of determining the best response to recover that signal and preserve their safety. The approach that Whitehouse, Feng and Fleming are developing would not be possible without development of the miniaturized radar, lidar (essentially a radar system using light instead of radio waves) and cameras that autonomous vehicles use to sense the world as they pass through it. “We now have pretty good ways to measure the world and predict what it will look like in the near future,” said Whitehouse, an associate professor of computer science. The group realized that the key to solving the problem of safety-critical mobile wireless was to use these devices to model the physical word and, having accomplished that, build a model of the wireless channel that reflects that understanding. To create the model of the physical world, Whitehouse is building a testbed using 1/10-scale connected autonomous race cars, which he will run through a series of situations thousands of times. During these trials, he will collect data about the physical world and the wireless channel and use this data, combined with predicted motion paths, to estimate future channel characteristics. Whitehouse’s ability to produce real-time predictions of wireless channel properties forms the basis of Feng’s contribution to the project. Currently, metrics used to evaluate wireless communication are typically based on averages. For instance, a wireless provider might guarantee that communication packets will arrive within a given interval 95 percent of the time. For safety-critical systems, averages, which might include the occasional failure, are inadequate. Instead, it is vital to know the worst-case scenario. “My role is to determine, given specific channel characteristics at any moment, how long will it take for another vehicle to receive a message,” Feng said. This is a highly complex challenge. In essence, Feng must devise a way to translate a multitude of channel characteristics, which, because the vehicles are moving, are constantly changing, into an uninterrupted stream of real-time predictions about worst-case channel performance. “We need to design new formal verifications methods that are fast and can address these dynamically changing channel characteristics,” she said. For his part, Fleming will design a control strategy that reflects the analyses that Feng generates, one that preserves the safety of each vehicle while maximizing overall system performance. While this task would be relatively straightforward with a just single vehicle, having multiple vehicles makes it exponentially more difficult. At any given moment, each vehicle encounters its own unique set of network conditions depending on its location. As a result, the worst-case channel performance it experiences in that moment would require a unique response. This constant reconfiguring of individual vehicles, which itself changes the channel characteristics, adds another level of complexity to Fleming’s control challenge. “To build an effective control system, we need not only to understand the world around us, but how that world will change based on our own manipulation of it,” Fleming said. If society is to reap the benefits of autonomous entities working together, whether they be cars, drones or robots, it must find a strategy to foster safety-critical wireless mobile communications. By linking their three areas of expertise, Whitehouse, Feng and Fleming hope to set a course that will make this a reality.